From practical checklists and tip sheets to more in-depth articles and case studies, we’ve tried to provide a variety of resources you need to succeed. Select any of the popular topics below to narrow your search. When you join NCRMA, you will have unlimited access to all of our exclusive resources, including ‘How Do I Comply’ step-by-step instructions following regulation changes impacting your business. Sales Should Always Be Top of Mind – What’s Your Recipe for Success? The following resources are excerpts from the 2015 Retailer’s Handbook published by the NC Retail Merchants Association. This 300-page, interactive flipping book covers all North Carolina laws impacting retail store operations. It is made available free to members and is sold to non-members for $250. For the full version, email Ann Edmondson at anne@ncrma.org. Should You Protect Your Small Business With a Security System? The following resources are excerpts from the 2015 Retailer’s Handbook published by the NC Retail Merchants Association. 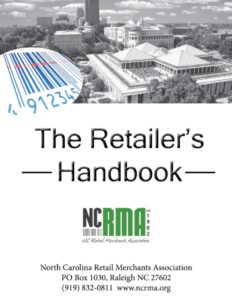 This 300-page, online book covers all North Carolina laws impacting retail store operations. It is made available free to members and is sold to non-members for $250. For the full version, email Ann Edmondson at anne@ncrma.org.